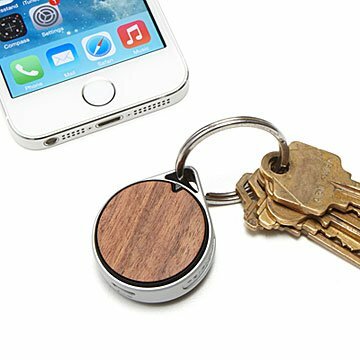 Keep easy-to-misplace items on your radar with this Bluetooth-powered rosewood tag and companion app. We've gotten so used to being able to find our missing phones by calling them—but what about those precious inanimate objects that can't emit a sound when beckoned? Your keys can't even vibrate. Enter the Bluetooth® tracking tag. Simply secure to your items that keep getting lost throughout the house (your iPad, the remote, keys, wallet), then be able to find them at a moment's notice with the Bluetooth® technology and the free downloadable app. Lost your phone, but have your tracking tag? No problem—this handy device works both ways! Just touch the alert button on the tag to locate your phone in minutes. It's a much faster alternative to looking everywhere for the car keys, only to find them hours later in the refrigerator. Made in China. Compatible with Apple iPhone 4S/5/5C/5S/6/6 Plus using iOS 5.1 or later. Not compatible with Android. Bluetooth Tracking Tag includes built-in rechargeable lithium-polymer battery. One charge lasts 2-4 weeks depending on use. Charge level is visible on battery indicator in iPhone app. Bluetooth Tracking Tag will beep when battery begins to die. Battery can be recharged with included USB cord. Bluetooth Tracking Tag has approximately 160 ft. range. This product no longer has an App that works with iPhone. No way to connect to device. Purchased for my son-in-law who is somewhat difficult to buy for. He was really happy when he opened it and was looking forward to using it. Many people wanted this particular gift; always a nice thing to see when it was YOU who brought the gift in the first place! Our son-in-law was excited about his gift. He has a habit of misplacing his keys. Now he will be able to find them quickly with the Bluetooth Tracking Tags. Bought this for my nephew who loved the look but said the app didn't work well. No longer loosing the keys. Fantastic Website, great ideas. Product just as I hoped for! Awesome product, clever idea and very helpful.